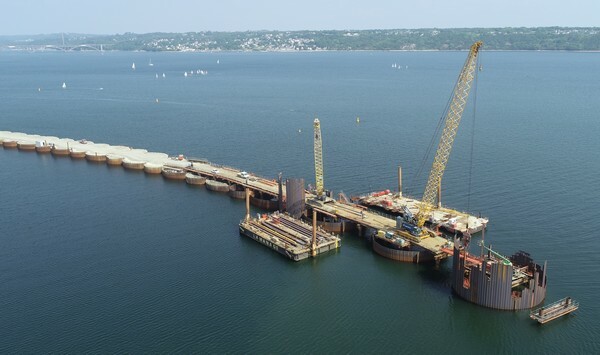 As part of the development of the Brest Harbour carried out by the Brittany Region, several companies of the Setec group (Terrasol, Setec International, Setec Hydratec and Setec In Vivo) have been assisting BOUYGUES TP RF for the construction of a 860 m long dyke-embankment, during the tendering and execution phases. The dyke will close up on the new wharf, which is under construction, allowing the creation of a future 14 ha polder (in addition to the existing 30 ha polder under development), designed for the Renewable Marine Energy sector. 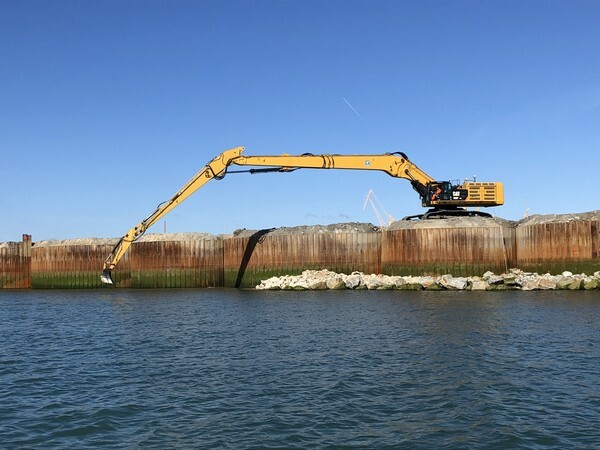 The dyke being built consists of a series of circular sheetpile enclosures (AS‑500) called “gabionades” (26 gabions and 25 festoons), covered on the sea-side by a riprap embankment. This alternative solution proposed by the contractor has replaced the embankment dam initialy planned. The construction of the dyke is in progress and is carried out by onshore means using a temporary jetty (140 m) with supply and storage through maritime means. The vibrosinking of the sheetpiles (20 to 33 m) is performed using a double-level circular sheetpile driving guide placed on metal tubes previously driven downto the bedrock. After the gabionade backfilling, the layers of the armour embankment are implemented. The geology of the Brest Harbour area consists of recent alluvial formations with muddy facies of about ten meters thick characterized by a high compressibility, and of a shaly bedrock. The construction solution adopted allows to maintain the muds in place by installing a network of vertical drains (415 km) on the height of the sediments layer, in order to accelerate the consolidation and to anticipate the primary and secondary settlements of the global structure. The studies carried out by TERRASOL allowed to justify the dyke’s design by checking the gabionade’s stability, its structural integrity and the riprap embankment stability; all of this taking into account the interaction between both parts of the structure. The gabionade is subjected to the active earth pressures, to the tides (differential of 5 m), to the swell, and to operating loads. The structure verification takes into account the various shear failure mechanisms that can develop in terms of external stability (sliding, bearing capacity and eccentricity) and of internal stability (vertical shear failure, internal soil failure – Brinch-Hansen type, sheetpiles tensile failure and declutching of the locks). These checks are carried out with analytical models using Talren and K-Réa softwares, which are developed by TERRASOL. It should be noted that an area with a deeper bedrock level required additional 3D finite element modelling. This analysis also made it possible to define the drains mesh associated with intermediate backfilling and consolidation phases, allowing for an increase of the short-term (undrained) mud layers strength as well as for the structure’s consolidation in the long term. The teams in charge of the studies and the construction worked in a continuous flow of communication in order to reach a schedule complying with the partial and overall deadlines of the project.